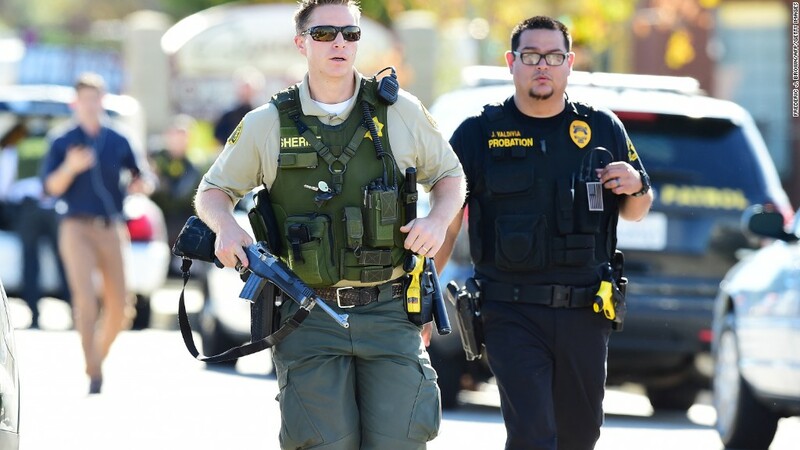 Last week's mass shooting in San Bernardino claimed 14 lives and got America talking about guns. Again. The debate -- again -- puts two sides in opposition. One argues there are too many weapons, and it's too easy for the wrong people to get their hands on them. But the other side says gun ownership is a right and part of the country's fabric, and more restrictions won't stop killers from killing. The creation of a system for federal background checks is one of the only major gun safety policies to get past that partisan blockade in recent decades. The FBI, which runs the background checks, says they help keep people safe while assuring legal access to guns. Still, debate over their effectiveness continues. Here's how they work. 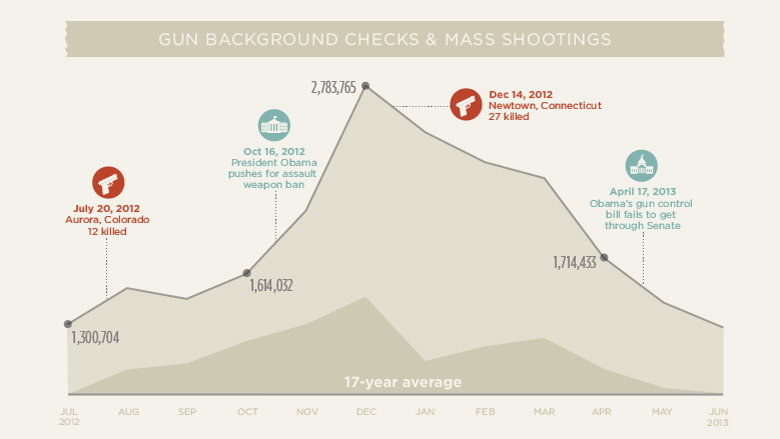 The FBI processed 19,827,376 background checks this year through November. That means 2015 will likely set the record for most ever. The current record was set in 2013, when the twin massacres in Aurora, Colorado, and Newtown, Connecticut -- five months apart in the second half of 2012 -- sparked a gun control push in Washington and a surge in gun sales. 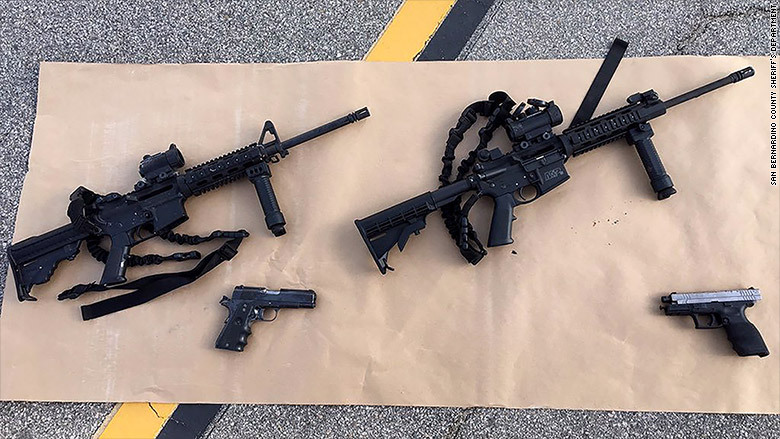 These AR-15-style rifles and semiautomatic handguns were used in the San Bernardino mass shooting. The FBI's National Instant Criminal Background Check System, also known as NICS, operates seven days a week, 17 hours a day, out of a facility in Clarksburg, West Virginia. It is open on holidays, except Christmas. All federally licensed gun dealers must run checks on all buyers -- whether the purchase is made in a store or at a gun show. The federal checks work like this: A buyer presents his or her ID to the seller and fills out ATF Form 4473 with personal information such as age, address, race and criminal history, if any. The seller then submits the information to the FBI, via a toll-free phone line or over the Internet. The FBI checks the applicant's info against databases. The process can take a few minutes. Of course, many guns are bought and sold illegally, without any background check. And the NICS system is only used by gun sellers with a federal license. Some states have passed additional gun control laws on top of the federal law, but others have relatively lax rules. Since the NICS system was started 17 years ago, the FBI has conducted 222,363,898 background checks. The FBI counts 1,258,427 "federal denials," most due to the individual's criminal history. Other reasons include "adjudicated mental health" (20,687) and "illegal/unlawful alien" (16,246). The FBI says 68 applicants were denied because they had renounced their U.S. citizenship. -- Have you ever been convicted of a felony? -- Have you ever been convicted of a misdemeanor crime of domestic violence? --Are you an unlawful user of, or addicted to, marijuana or any other depressant, stimulant, narcotic drug, or any other controlled substance? --Are you a fugitive from justice? --Have you ever been committed to a mental institution? There is no official tally of how many guns are sold in the United States. Industry experts make informed estimates. The FBI background checks are a close proxy of how many guns are sold, but not a one-to-one measure. But there's no doubt the gun industry is doing well. The stock of Smith & Wesson (SWHC) is up 101% this year. 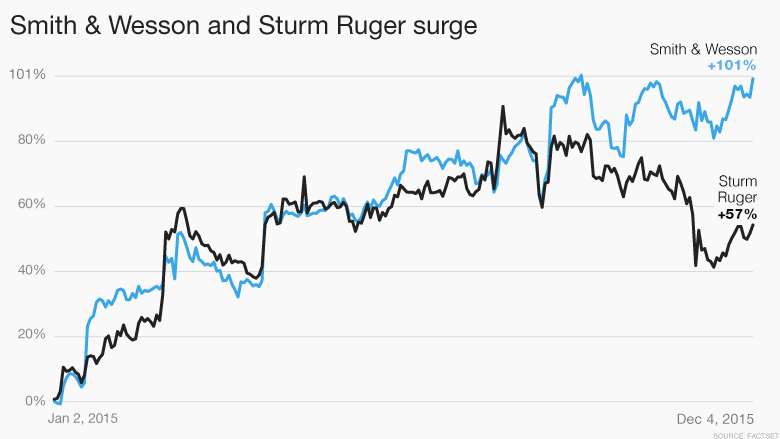 Shares of Sturm Ruger (RGR), another major gun maker, are up 57%. Ammunition company Orbital ATK (OA) is up 60%. The National Rifle Association, the lobbying group that advocates for gun rights, says a broader system of checks on gun buyers wouldn't stop criminals from getting guns. Most guns used in crimes are obtained through theft, "on the black market," or from family members, the NRA says. Many illegal guns are obtained by "straw purchasers," people who pass background checks and then turn over guns to criminals. "No amount of background checks can stop these criminals," the NRA says. Gun background checks were first mandated by the Brady Handgun Violence Prevention Act of 1993. The law was named after Jim Brady, the press secretary to President Reagan who was left paralyzed by John Hinckley's attempted assassination of Reagan in 1981. Brady died last year. The Brady Campaign, a leading gun control lobby, says background checks work but wants Congress to do more and close exceptions to federal checks. Right now, generally only federally licensed dealers at gun shows must do checks, for instance. 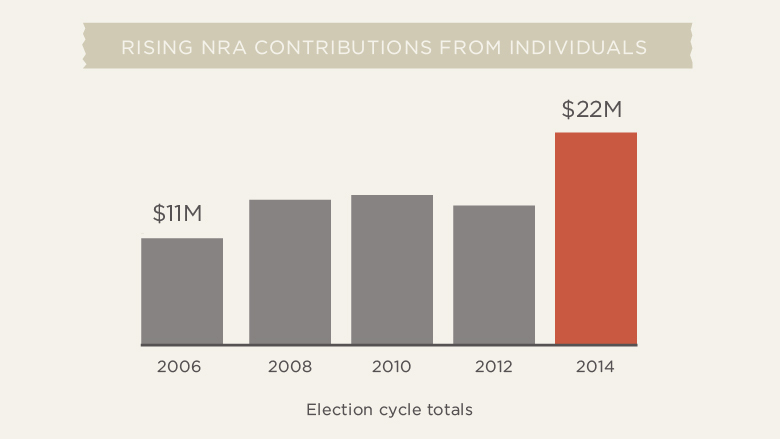 Meanwhile, the Brady Campaign and other groups have helped spur gun laws at the state level. The last major attempt at federal gun control was about three years ago. President Obama and Democratic leaders proposed a plan to expand background checks and restrict some semi-automatic weapons. The legislative effort followed the December 2012 murder of 20 children and six adults by Adam Lanza at Sandy Hook elementary school. The Senate defeated the bill in April 2013. 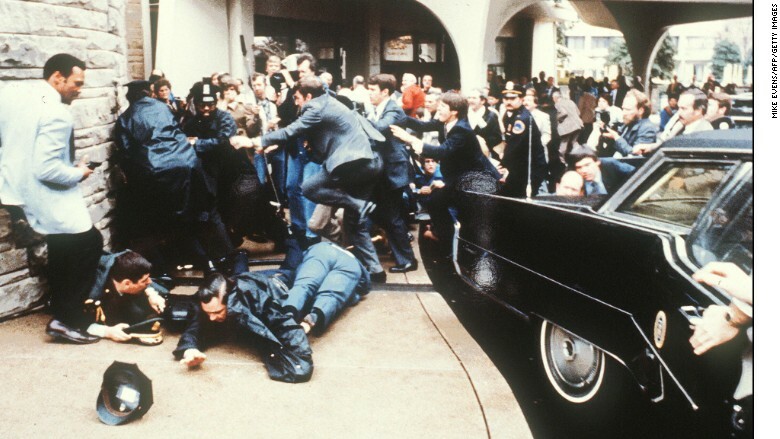 This photo was taken on March 30, 1981, moments after John Hinckley shot President Reagan outside the Hilton Hotel in Washington. Reagan's press secretary, James Brady, was also shot and left paralyzed.